Review brochure for all details. The basic principle of the solid bowl centrifuge has been known since the end of 19th century. Over the course of time, technology improvements along with the availability of high strength and corrosion resistant raw materials have allowed solid bowl decanters to be applicable to many processes. The utilization of electronic and electromechanical measuring and control components has improved the performance and availability of the machines. The basic design of a solid bowl centrifuge is relatively simple and can be customized by Flottweg for different requirements. Of all modern industrial centrifuges, solid bowl centrifuges have the broadest range of application. The slurry is fed through a stationary pipe into the feed zone located in the center of the scroll. The product is then accelerated circumferentially and delivered through distribution ports into the bowl. The bowl has a cylindrical/conical shape and rotates at a pre-set speed optimal for the application. The slurry rotates with a different scroll design or by modifying an existing scroll. Scroll pitch and single or multiple flight configurations are important design variables. The scroll rotates at a slightly different speed than the bowl and conveys the deposited solids toward the conical end of the bowl. This differential speed determines the residence time of the solids in the bowl. Residence time is an important variable for the dry solids content. It can be adjusted by changing the differential speed of the scroll thus providing optimal separation. If the physical properties of the slurry change, FLOTTWEG CENTRIFUGES can be supplied with a different scroll design or by modifying an existing scroll. Scroll pitch and single or multiple flight configurations are important design variables. FLOTTWEG uses high-quality stainless steel for all wetted areas. Bowl and scroll castings are made from centrifugal cast high strength and corrosion resistant stainless steel. A special selection and arrangement of bearings provides long life and exceptional reliability. A central lubrication system supplies either grease or oil to bearings. The clarified liquids flow to the cylindrical end of the bowl where they exit over weir plates. Easily adjustable precision weir plates allow for the precise adjustment of the pond depth in the bowl. Overflow is then collected in a centrate chamber and discharged by gravity. Concerning waste water decanters, the most important objective of Flottweg developments is the maximum dewatering of the sewage sludge. The dryer the dewatered sludge, the easier it is to dispose of it and the more it helps the operator to save money. Due to the new C-series, which was launched in 2008, Flottweg succeeded in increasing the capacity of its machines and at the same time reduce energy consumption up to 20-30%. Efficient acceleration of the product in the feed zone combined with very specific internal scroll designs results in smaller installed horsepower requirements and lower overall power consumption of the motors (up to 20 – 30 %). This is a dramatic reduction of power consumption. Due to higher internal sedimentation volume, the capacity of a similar-sized machine is increased by 10 – 20 %, which ultimately results in lower investment costs since it is now possible to use a smaller machine for the same feed rate without suffering in processing performance. This helps the end user overcome capacity bottlenecks without sacrificing centrate or discharged cake quality. Since the summer of 2008, more than 100 decanters of the new C-series have been installed and run in different waste water applications. The three available models C3E, C4E, and C5E cover processing ranges up to 90 m3/h (44 – 396 gpm). The Dynamic Radial Wedge (DRW) belt press is the new benchmark for quality and performance. 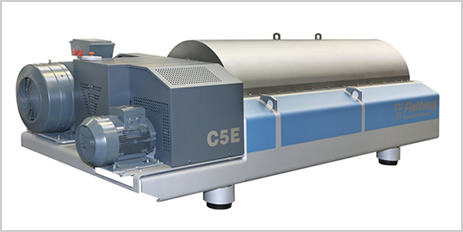 It has higher throughput rates than comparable models, achieves higher cake solids and uses less power. The high performance Dynamic Radial Wedge Belt Press is the most technologically advanced belt press in the world today. It is capable of processing unstable, slow draining materials at flow rates 50% higher than comparable models while achieving consistently higher cake solids. The 3-meter, 15-roll BPR boasts an outstanding 725 square feet of filtration area that, combined with other key engineering innovations, does the work of two conventional 2-meter belt presses. The Dynamic Radial Wedge Belt Press is available in 1.2, 1.6, 2.0, 2.5 and 3.0 meter designs and can be equipped with up to 15 pressure rollers. 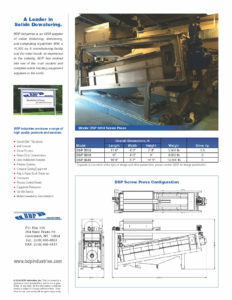 This allows the press to be customized to fit every dewatering application. It is a proven performer in the harshest, most demanding industrial and municipal environments. The DRW is an outstanding value that provides the highest possible return on your dewatering investment. Largest filtration areas of any press in its class. Strong, stiff “I” beam frame. Rack and pinion equalization system. Pneumatic air bellows tensioning and tracking system. Proprietary interference fit roller construction. The radial wedge design allows the press to produce extremely high cake solids even with difficult, slow draining materials. The low friction rolling wedge reduces power consumption by 50% or more over standard designs. Large filtration areas are critical to maximizing performance, throughput rates, and solids capture. The extremely strong, stiff “I” beam frame enables application of higher dewatering pressure to maximize dewatering performance. The dual belt drive system applies uniform tension to both belts to improve belt life and overall press performance. Equal length belts minimize inventory costs, cut maintenance costs and simplify belt replacement. The rack and pinion equalization system assures accurate belt tracking to maximize belt life. The pneumatic tensioning and tracking system eliminates the mess and maintenance of hydraulic systems. The air bellows actuators eliminate seal leakage problems encountered with common cylinder actuators. 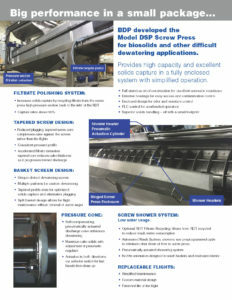 The proprietary “interference fit” roller construction completely eliminates roller failures and costly press downtime. Modular frame design allows additional rollers to be easily added at a future date to accommodate plant process changes or higher throughput/cake dryness requirements.